Win up to 1,500 coins and play from 50p a spin. Microgaming’s Halloween slot offers 50 pay lines and chilling features that include a boogeyman bonus. 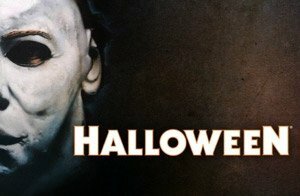 In 1978, the Halloween horror flick scared the living crap out of lots of people. It’s terrifying, and still popular to this day. The story of Michael Myers is disturbing. So what more appropriate than to make an online slot dedicated to the psychopathic murdering maniac himself. 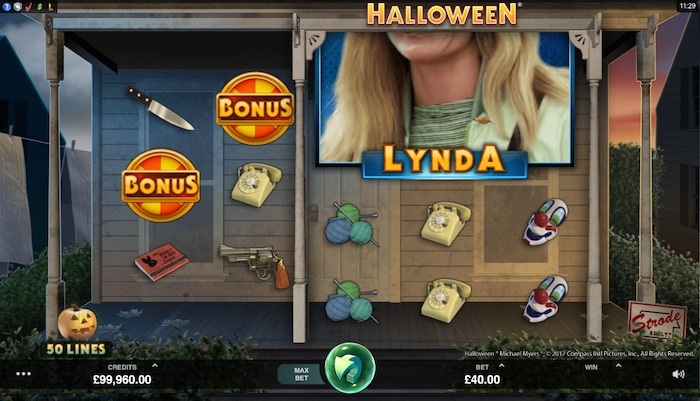 The Halloween online slot is a 50 pay line game that you can play from 50p to £200 a spin. Designed superbly around the slasher flick of the same name, Microgaming stays close to the original movie. It features the creepy soundtrack, characters including menacing Michael and a 5 reel backdrop of the dreaded house. If you’re looking for a slot with good graphics, a dark atmosphere and plenty of features. Halloween is for you. Besides frightening players by having Michael Myers stalk the reels in the background. There’s enough in this game to keep us anticipating that big win. Wandering reels with jumbo blocks can mean big prizes whereas the trick or treat bonus wheel can multiply your betting stake. As for the free spins bonus, they’re character driven with 9 free games on offer while a boogeyman bonus offers a pick and win function. You can play Microgaming Halloween on mobile, tablet and desktop. How much can you win playing the Halloween slot? Take a look at the pay table. You’ll find lots of symbols including weapons, clown masks, bonus wheels, Michael Myers and other characters. But what do they pay and how much can you win? To answer this question as best as we can, we’ll look at playing at the lowest and highest limit. 50p and £200 a spin. Halloween is 50 lines too, so there’s lots of room for multiple wins. 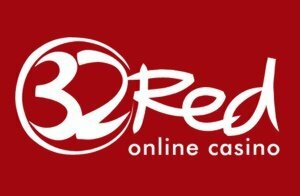 50p slots players will find pay line wins ranging from 1p to £5.00. If you then consider the 50 pay lines, there’s a lot on offer. Bigger wins will no doubt come from the features. At 50p, the pick and win bonus could award up to 290 x the betting stake, that’s £145.00 while the slots jackpot of 1,500 x coins (£0.01) would be a modest £7.50. High rolling Halloween slots players go for the bigger fish. And why not if betting at £200 a spin. The paytable now offers the lowest pay line win of £4.00 for 3 x knitting ball symbols and £2000 for 5 x Laurie symbols. The boogeyman bonus could pay up to 290 x betting stake, that’s a staggering £58,000 whereas the 500 x stake in the free spins would be £100,000. Please note these are the largest wins possible. The jackpot if playing for £200 a spin is 1,500 x coins (0.50 x 8 = £4.00) all eight coins in play totals £6,000. To calculate the conversion of your coins to credit. It’s the number of coins x coin size played = credit. Wandering reels with jumbo blocks, trick or treat bonus wheel, boogeyman pick bonus and free spins. Wandering reels is the Halloween online slots base game feature. While not one of the bonuses, this 3 x 4 grid contains a jumbo block of 12 symbols. It’s better that Microgaming has used it, because wandering reels mean big wins, especially if they stop on the left-hand side of the reels. Jumbo blocks are large symbols that span multiple reels, always handy when it comes to multiple wins. Three bonus symbols will trigger the trick or treat bonus wheel. What is it? A wheel you spin that lands on a betting stake multiplier or leads you to boogeyman bonus or free spins round. You can hit multipliers of up to 10 x your betting stake and do this continuously until you land on one of the features. The more sinister and rewarding of the bonuses (in our opinion) is the picking bonus. Just land on Michael Myers on the trick or treat wheel and the nightmare begins. You’ll find yourself inside Michael’s house hiding in terror. Look for the brown leaves of Autumn, turn over the right ones and find cash prizes. Others you’ll find knives that will defend you, and then there is the boogeyman. He will end you cash winning frenzy. As frightening as this one is, it can award up to 290 x your betting stake. The Halloween slot free spins round is again found on the trick or treating wheel. How? Simply land on one of the four characters. You’ll know this is happening because all of a sudden it gets scary. Lightning strikes, the sky turns black, and it’s night time. You’ll be awarded 9 free spins with the triggering character replacing all other high symbols and jumbo blocks. Now it’s all about facing your fears. But with up to 500 x your betting stake on offer, there’s no need to be afraid. With all the new slots coming out at Halloween, Microgaming goes all out with this one. But is it worth the hype? The good thing about this game is how it looks and feels. It’s very dark and will have horror slot fans hiding behind the sofa. It’s feature-rich, and you can bet from just 50p a spin. But there’s a tendency if betting low to witness lengthy periods of small wins, and with Michael Myers lurking behind the reels. It might not be safe to spin around and wait. That said, we like it. The Halloween slot is a cult favorite already.